White wine is usually made from white grapes but can also be produced from red grapes where minimal contact with the grape skins is allowed to take place. Such wines are known as blanc de noirs in French. The grapes are de-stemmed and crushed before being pumped into a wine press to squeeze out all the juice. The juice is then clarified before being moved into vats to ferment. Maceration, contact with the skins, with white grapes is uncommon and only used when a winemaker wishes to extract flavour compounds from the skins. This is called a cold soak and is only ever implemented for a few hours unlike the much longer soak given to many red wines to extract both colour and tannins. Macerated white wines have a deeper colour and a higher polyphenol content. Highly aromatic grape varieties such as Sauvignon Blanc, Viognier and Riesling gain the most from this technique. Many wine regions produce great white wines but the more famous tend to come from the Loire valley, Burgundy and Bordeaux in France. Key white grape varieties include Chardonnay, Sauvignon Blanc, Chenin Blanc, Sémillon and Riesling. There are many more all of which have distinctive characteristics. 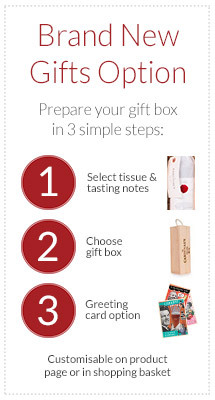 Dry white table wines fall into three main taste categories: Light & crisp, fruity & supple and full-bodied whites. Light and crisp whites provide easy drinking. These are refreshing and floral with fruity notes but with little in the way of complexity. Maçon-Villages, Bourgogne Aligoté, Petit Chablis and Apremont fall into this category. Best drunk with simple dishes but also with fried fish, oysters, mussels, and charcuterie. It is unlikely that these wines will age well so drink young. Serve at 8°C. Fruity and supple white wines are fresh and full of fruit, quite often with citrus notes. Wines from Chablis, Pouilly-Fumé, Pouilly-Fuissé, Graves and Sancerre are good examples. They usually go well with shellfish, many seafood dishes, cheeses and charcuterie. Full-bodied whites have the most complexity and class. Rich and creamy still with a lovely freshness, these wines tend to be matured in oak casks where they pick up notes of vanilla and toast. Many great wines are in this category including Meursault, Chablis Premier & Grand Crus, Corton-Charlemagne, Puligny-Montrachet and Montrachet from Burgundy as well as wines from Pessac-Léognan in Bordeaux. Well-suited to high-end dining these wines are perfect with lobster, delicate fish, white meats, creamy sauces and creamy cheeses to name a few. Serve a little warmer than the others at 10-14°C. 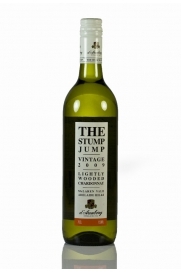 The Stump Jump is a charming, lightly-wooded Chardonnay from the famous d'Arenberg winery. The grapes are carefully crushed and basket pressed to produce a fresh, crisp white wine which is oaked to give a beautifully smooth finish. Lovely to drink on its own or a great accompaniment to a meal.